I am here in Krakow, Poland, for World Youth Day 2016, serving as a priest-volunteer assisting the Sisters of Divine Mercy in welcoming the thousands of young people coming on pilgrimage to their convent chapel, better known as the Sanctuary of Divine Mercy. I saw before me a great multitude, which no one could count, from every nation, race, people, and tongue (Revelation 7:9). And, like St. John, as I am standing here praying and singing, giving explanations and directions to pilgrims, I find myself constantly asking, “Who are all these people, and where did they come from?” (Revelation 7:13). To begin to answer that question, it is helpful to recall a bit of the history of the city of Krakow. Eighty years ago Krakow had one of the largest Jewish populations of any city in the world, destined to be slaughtered a few miles west of here at Auschwitz in the horror of the Holocaust. The fact that this city ran with blood, Jewish blood, during the Nazi occupation is a mystery I am constantly drawn to ponder. As a great spiritual darkness fell upon Europe and the whole world in 1939, it gradually came to be revealed that Jesus had kindled a tiny light here in this convent that was destined to be revealed as a message of spiritual import for the whole world. The words of the Merciful Jesus recorded by St. Faustina in her diary, Divine Mercy in My Soul, have now been translated into over twenty languages. The prayer known as the Chaplet of Divine Mercy did not exist until an obscure uneducated nun wrote it down here in her prayer book in 1931. Just this afternoon I heard the Chaplet being prayed in Polish, Italian, French, Spanish, English, Portuguese, Chinese, Swedish, Dutch, German, Russian, Ukrainian, and Arabic. How is that even possible? What does it all mean? I have no simple or easy answer. But I am inviting you to ponder and pray and contemplate that there is an unprecedented anointing of the Holy Spirit being poured out upon Krakow and given to the whole world this week. Jesus told Sister Faustina, “The flames of mercy are burning Me. I desire to pour them out upon human souls. Oh, what pain they cause Me when they do not want to accept them! Tell aching mankind to snuggle close to My merciful Heart, and I will fill it with peace” (Diary of Divine Mercy, 1074). “Mankind will not have peace until it turns with Trust to My mercy” (DDM, 300). In his desire that all mankind come to know the great love contained within his Heart, Jesus chose a heart humble like his own. He told Faustina that although she and her work would encounter great opposition and difficulty, he would give her humility through her trials, and as a result she would have all the strength and grace she would need to accomplish his will, although never without the Cross. Very early in her call, he told her, “I desire that this image be venerated, first in your chapel, and then throughout the world” (DDM, 47), and then a bit later, “I want it to be venerated publicly so that every soul may know about it … I will be granting many graces to souls, so let every soul have access to it” ( DDM, 341, 570). It seems to me that this week of World Youth Day could very well be a week when more souls will venerate the Divine Mercy image in person than any other week in history. God made the motherhouse convent in Lagiewniki-Krakow holy by drawing St. Faustina close to his heart here, and now through her sainthood he is drawing the whole world to himself. The image of grace pouring out of his open heart, the heart lifted up on the Cross and pierced for our offenses, draws every person close to the wounds of Christ so that each person may know how loved they are by God, how totally they are forgiven, how completely Jesus wants to heal the wounds of sin in their lives. The Merciful Heart of Jesus transforms revenge, hatred, and fear into abundant graces of forgiveness, love, and trust. Of course, there is one other important link in the great chain of events that has brought the whole world to St. Faustina’s shrine here in Krakow. The astonishing election of Karol Wojtyla to the papacy in 1978 brought his fearless proclamation of the person of Jesus Christ as the redeemer of mankind to the world stage. Krakow is, in an unparalleled way, the city of Poland’s most famous son (even the airport here is named after John Paul II!). The streets are filled with banners carrying his image this week, and a generation of teenagers who only remember him as an old and physically feeble man are having an encounter with the Holy Spirit whom John Paul II vigorously called down upon his beloved Poland, upon the universal Church, and upon the whole world. 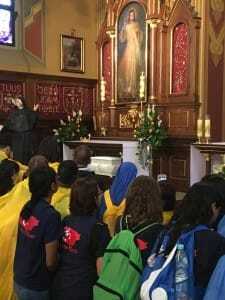 As the youth wait in line to enter the chapel for a few moments of prayer, the sisters of St. Faustina lead prayer and reflection with them, constantly reminding them that Pope John Paul II himself came here often to this chapel to pray as a young man: “Like him, may you listen to Jesus here in this holy place … and then do not be afraid to do whatever Jesus asks of you!” The contagious enthusiasm which is filling the streets of Krakow, a city transformed from a place of fear of the Gestapo to one of joyful witnessing to the gospel. This astonishing transformation of a city is one of the trademarks of each World Youth Day and an ongoing personal gift of Pope John Paul II to the youth of the twenty-first century. God has set a limit to the power of evil, a power which at times seems to overwhelm us, and the name of that limit is Divine Mercy. The “aching mankind” of which Jesus spoke is in many ways embodied in the young generation of today, painfully aware of the presence of evil in the world and in human hearts, yet holding a desire for healing and wholeness which can never fully be extinguished. This week I am witnessing Jesus pressing an aching generation close to his Merciful Heart. The youth of the world are here in this holy city crying out to God with a prayer of longing, of hope, of joyful trust, of constant intercession for Mercy. They are tasting, many for the first time, the peace and love for which the human heart has been made by God. May the fruits of World Youth Day 2016 in Krakow be a blessing for the entire human race for many years to come. O blood and water, which gushed forth from the Heart of Jesus as a fountain of Mercy for us, I trust in you! St. Faustina, pray for us. St. John Paul II, pray for us. Mary, Mother of Mercy, pray for us. 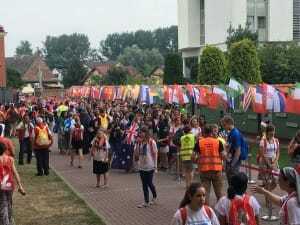 Thank you for sharing your experience at WYD. It is a wonderful reminder to all, that the youth of today are also searching for and finding peace in the presence of Christ. The media would have all believe that young people have turned away from religion but the huge gathering in Kraków tells a different story. The youth are the hope of the future. I continue to pray for them and encourage others in this prayer. God bless the work you do Father.